Yes, I hate a cliffhanger as much as the next person, and this is also the first book I picked up from Elizabeth Hunter while waiting for the next big one to catch my eye. The story starts with Ava, a lonely traveler, freelance photographer who ventures into Istanbul, for a photo shoot and to see about a doctor she was referred to who may be able to help her with the “voices” she constantly hear when around other people. We also meet the Irin scribes, the worlds oldest record keepers, and their nemesis – the Grigori soldiers who kills human woman for their energy. I decided to hold off on posting a review on The Scribe, and could not wait to get my hands on the next book. Then at last the second book in the series was released, The Singer. Although this book was a slow start for me, it was the most nail biting book of the trilogy, what will happen to the scribes, what is the Grigori planning,and why is the fallen just sitting and watching? It was a well written companion book to The Scribe. Elizabeth fleshed out, not only the characters, but also the world they inhabit, their ancient ways and traditions. I makes you wish this world really existed so you could go and visit there – it’s that realistically written. Congratulations Karina, on another book, and your first romance. Well done! The reason for my 4 star rating of a 5 star book is after seeing your incredible support, beta and edit exams, it was sad for me to come across so many unnecessary grammatical errors. It feels like it was only run through a spell checker for the major spelling errors. The story deserved so much more, as did your incredible humor. I started reading late at night, and had to physically smother my laughter into my pillow to try and not disturb the rest of the sleeping souls in the house. Mateo, Vera and the other Spanish people (and the Angles too) were created with so much life and spirit in them, I can actually visualize myself hopping on a plane to Spain to join the conversational English classes for business people, and have a glass of that wine!. The story line is very sweet and follow a few relationships borne from the month long “language camp”, where everybody lives together, eats and parties for a month in Spain, in English. 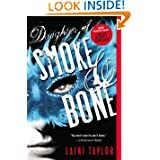 Days of blood and starlight and the last book Dreams of Gods and Monsters by Laini Taylor. The author has such a unique writing style, the characters are so real, and set to start in the city of Prague, these books were a fairy tale made in Eretz 🙂 . The trillogy is about a human girl called Karou who lives two lives, one in the human world, and going through special portals, into “elsewhere” as she knows it. Her protector Brimstone (a chimera – mix between human and animal person) collects teeth and strings them up into necklaces but Karou has yet to figure out why, since nobody will let her in on the secret. And then there is the strange tatoos that’s been on her hands since she can remember (hamsas that look like open eyes on each palm). What are they for? Brimstone deals in wishes and for an early birthday Karou wishes for her hair to be a beautiful dark blue (Lapizlazuli) – and she studies art at the local art college with her pixie sized friend Zuzannah. The books take you deeper into both worlds, and introduce you to the legions of Seraphim armies, of which Akiva is a soldier, but something mysterious draws him to Karou.